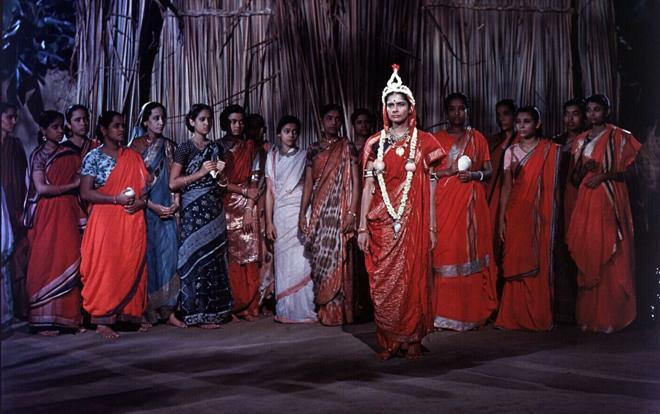 This entrancing first color feature from Jean Renoir—shot entirely on location in India—is a visual tour de force. Based on the novel by Rumer Godden, the film eloquently contrasts the growing pains of three young women with the immutability of the holy Bengal River, around which their daily lives unfold. Enriched by Renoir’s subtle understanding of and appreciation for India and its people, 'The River' gracefully explores the fragile connections between transitory emotions and steadfast creation. How does that old song go? "I'm not a girl, not yet a woman." Yeah, I just quoted Britney Spears lyrics at the beginning of a review for a Jean Renoir film… but I promise you that line is more than appropriate! You see -- assuming you're still with me -- that simple adage perfectly sums up one of the central struggles that rests at the heart of the legendary French director's first color feature, 'The River.' Thankfully, since Renoir's work tends to be a tad deeper than your average sugary pop song, the movie also tackles several other interesting themes, using its eternally flowing setting to evoke a powerful metaphor for life's perpetual cycles of growth and change. As one young girl (or is it young woman?) struggles with her journey through adolescence, the filmmaker also presents a marked transition in his style, fully embracing both the limitations and benefits of the Technicolor process -- resulting in an undeniably gorgeous coming-of-age tale. Based on the novel of the same name written by Rumer Godden, the story focuses on a British family that lives near the Ganges River in India. Our main focus becomes Harriet (Patricia Walters), a precocious adolescent who develops a passionate crush on an American soldier, Captain John (Thomas E. Breen), who has come to stay with her neighbors. Overwhelmed by her first flirtations with young love, Harriet soon becomes jealous when John's affections stray toward her older friends Valerie (Adrienne Corri) and Melanie (Radha). As the delights and pains of unrequited romance blossom, inescapable currents begin to guide the characters toward a bittersweet finale. Shot entirely on location in India, the film offers a mostly respectful and delicate admiration for the country's culture, infusing the proceedings with a rare sense of authenticity. With that said, this is still a tale about India strictly told through Westerner's eyes (Indian characters are relegated to supporting and tertiary roles only), but the film never pretends otherwise, clearly capturing the location and its people as filtered through Harriet's perspective (and Renoir's lens). To this end, recurring voice over narration is provided from an adult Harriet, filling us in on details related to her family and the local customs. This narration is woven throughout the script's classic coming-of-age narrative, chronicling themes of love, growth, jealousy, confusion, and change. And while these elements prove to be rather affecting when all is said and done, the drama does adhere to a certain old fashioned quality (common for this time period), including some outdated dialogue and a telegraphed tragedy. Likewise, the acting can be a little suspect at times (especially from Thomas E. Breen), as Renoir relies on a mostly amateur cast. Thankfully, most of the main performers are effective in their parts, and Patricia Walters (in her only feature film role) does a commendable job of carrying the picture. For his part, Jean Renoir also does a commendable job with his directing duties, but fans of the filmmaker might be a bit surprised by the lack of his usual stylistic trademarks. The director is well known for his use of reframing camera shots, but due to the logistical limitations of shooting with a large and noisy Technicolor camera, tracking sequences are essentially absent. Instead, most of the runtime relies on stationary shots or simple pans, push-ins, and push-outs. Still, despite a surprising amount of cuts and reaction shots, the director does continue to favor wide masters, and there are several striking compositions that make use of every plain of the frame. One scene, for instance, features Harriet in the foreground, Valerie in the middle-ground, and Captain John in the background. Both women watch the man from hiding spots without his knowledge, and the manner in which they are positioned diagonally in the same single frame perfectly enhances the building drama of the sequence, drawing them together while still keeping them apart. And while we might lose most of Renoir's famous camera movements, in their place we gain the director's absolutely gorgeous use of color. Bold costume and production designs offer beautiful saturation, and the green of trees and vegetation is emphasized nicely. A fantasy sequence set within one of Harriet's stories about an Indian wedding is also particularly noteworthy, with deep reds and blues, and a fantastic shot depicting traditional Indian dancing. Certain compositions and color palettes even begin to evoke the paintings of the director's legendary father, Pierre-Auguste Renoir. And outside of these more deliberately crafted shots, we are also treated to several documentary-style sequences that simply capture the Indian people amidst their daily life by the river, reinforcing the film's straightforward appreciation for the rhythm and soul of its location. 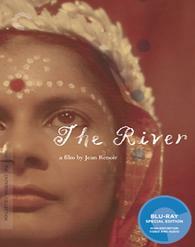 Criterion presents 'The River' in their standard clear case with spine number 276. The BD-50 Region A disc comes packaged with a pamphlet featuring an essay by film scholar Ian Christie and notes by the director. Restored from the original 35mm three-strip Technicolor camera negatives, the movie is provided with a 1080p/AVC MPEG-4 transfer in the 1.33:1 aspect ratio. Marked by gorgeous cinematography, this is a rather beautiful looking video presentation. The print is in great shape with only very marginal specks, vertical lines, and pulsing present from time to time. Likewise, a natural layer of light grain is visible throughout. With that said, there are a few wide shots that look just a tad noisy around skies and trees. Overall clarity is pleasing, offering a solid sense of fine texture and detail, especially in the beautiful Indian costumes and locations. Dimensionality, however, is a bit underwhelming, and the picture boasts a predominantly flat quality. Though perhaps a tad faded, the Technicolor palette looks quite lovely, mixing in bold splashes of reds, blues, purples, and greens among the otherwise brown/yellow settings. Contrast is well balanced, but black levels looks a little elevated in nighttime scenes. Free from any major signs of damage or unnecessary manipulation, this is a very respectful restoration. It's not the most impressive looking Technicolor release that I've seen on Blu-ray, but it's still a great transfer. The audio is presented in an English LPCM mono track. Despite a few age-related quibbles, the track sounds quite good. Speech is clear and relatively full throughout. With that said, there is some occasional background hissing present in the mix, but thankfully this does not prove to be a major concern. The mono track offers a decent sense of atmosphere, with some effective nature sounds. Likewise, the film's use of authentic Indian music comes through with solid range. About on par with what audiences have come to expect from tracks of this age, the audio has been cleaned up nicely and complements the video well. Criterion has put together a good collection of supplements, including a documentary and introduction from the director. All of the special features are presented in 1080p (unless noted otherwise). English subtitles are also provided for the foreign language portions. Renoir Introduction (HD, 8 min) – The director briefly sets the stage for the film, covering his path toward getting the rights to the book and what it was like to shoot in India. Martin Scorsese (HD, 13 min) – Presented in upscaled 1080i, this 2004 interview with Scorsese traces the movie's deep impact on the director. The filmmaker discusses the first time he saw 'The River' as a child and elaborates on its use of color and influence on him. Around the River (HD, 60 min) – Presented in upscaled 1080i, this is a 2008 documentary about the film's production. The participants detail how Renoir got the film made, his impression of India, and how he gained the author's trust. We also get lots of details about the shoot, filming in India, and the difficulties associated with the Technicolor camera. Kenneth McEldowney (47 min) – Here we get a few audio excerpts from a 2000 interview with the film's producer. McEldowney provides details on how he got involved with the picture and the reasons for him wanting to make a color movie in India. He also shares numerous tidbits about his work on the film, casting, and collaboration with the director. Though he can ramble a bit at times, this is a very informative discussion. Jean Renoir: A Passage Through India (15 min) – This is a new video essay by writer Paul Ryan about the movie's prodcution. Ryan addresses Renoir's dissatisfaction with his Hollywood work while tracing the film's production history, use of color, and role in the filmmaking development of famous Indian director Satyajit Ray. Trailer (3 min) – The film's trailer is included. 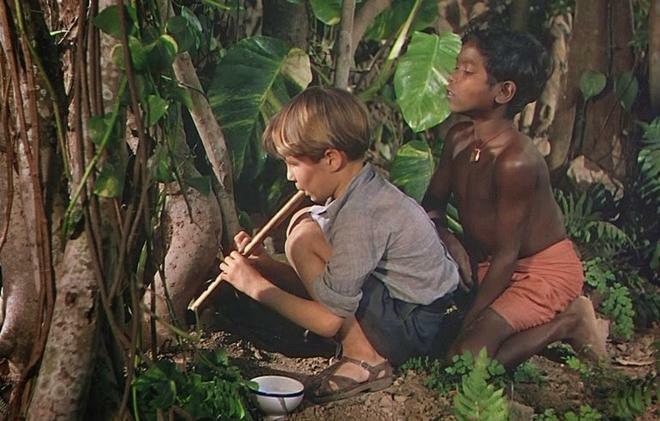 Jean Renoir's 'The River' is a beautiful Technicolor coming-of-age film. Though certain elements might be a tad outdated, the story offers an affecting portrait of love and change. The video transfer is strong, offering an impressive restoration of the color photography, and the audio mix is very solid. Criterion has also put together a nice assortment of special features that illuminate many details about the location shooting India. Though I still prefer the director's French black and white productions, this is still a very worthy and slightly atypical effort from the celebrated filmmaker. Recommended.